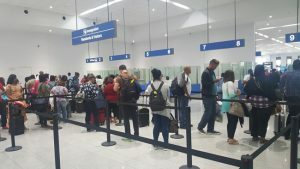 The US$150M airport expansion at Timehri entered a critical phase with the new Arrivals Terminal, at the south of the old terminal, officially opened yesterday. Authorities there said that passengers were treated to local fruit juices and snacks compliments of the airport management. Banks DIH and DDL participated by offering passengers their branded beverages. The project, due to be finally completed this year, was started by the previous administration but ran into budgetary and other problems with the Chinese contractor. Guyana is now getting a smaller than envisaged airport, because of the initial mismanagement. Shame on the previous government for mismanaging the airport project and for us ending up with a smaller than planned airport. That is why the bastards should remain in the opposition.